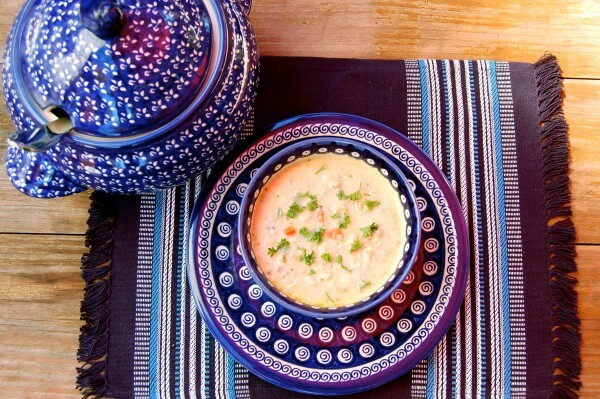 Blue Ridge Brewery’s Chicken And Wild Rice Soup is perfect winter meal. Preparing a smoked turkey stock for this recipe makes all the difference, transforming a dependable standard into a spectacular soup. bay leaf, salt and wild rice. Reduce heat to low and simmer until rice is tender but still firm to bite, 50 to 60 minutes (time will vary depending on variety of rice). Heat butter in a large heavy pot over medium heat. Add bacon and cook until it begins to brown, stirring often, about 5 minutes. Using slotted spoon, transfer bacon to paper towels to drain. Sprinkle chicken thighs with salt and pepper, and sear in bacon fat 5minutes per side. Transfer chicken to a bowl. Add onions to pot and cook until golden, about 8 minutes. Lower the heat to medium-low, add wine to the pot and deglaze, scraping browned bits from the pot. Stir in garlic, rosemary, thyme and parsley; cook for about a minute. Return chicken (with juices) and bacon to the pot. Add carrots, celery, mushrooms and corn; cover and cook for 45 to 60 minutes, checking often to make sure there is some liquid in the pot. Remove chicken skin and bones from the pot; shred chicken. Remove bay leaves, turkey necks and bones from the stock. Carefully poor stock and rice over to the pot with chicken and vegetables. Stir to combine. Stir in cream and cook for 10 more minutes. Melt butter in a skillet, add flour and whisk until combined. Continue cooking for 5 minutes, whisking. Carefully add roux to the soup (it will bubble vigorously), stir to combine. Season to taste with salt and pepper. Serving great food, craft beer, fine wine and top shelf alcohol.